One of the many beautiful views you can expect with a stay in Port Washington. Photo: Knickerbocker Bay Club. Whether you're traveling into Port Washington for work or for play a comfortable stay is a critical part to the overall experience. Port Washington and its surrounding area offers numerous places for a comfortable stay. One of the more notable locations in Port Washington for a stay is at the Knickerbocker Bay Club Boatel. Never heard of a "boatel"? It's a hotel located on the waterfront. This boatel features six waterfront rooms, so all you have to do is pull up on your boat and enjoy a comfortable stay. And you're welcome to stay at the boatel even if you don't have a boat. The boatel is part of the Knickerbocker Bay Club, a waterfront condo community for adults age 62 and over. Whoever chooses to stay here will be sure to get a magnificent view of Manhasset Bay. Of course those looking for the traditional hotel stay can also find many options surrounding the Port Washington area near Route 25A. 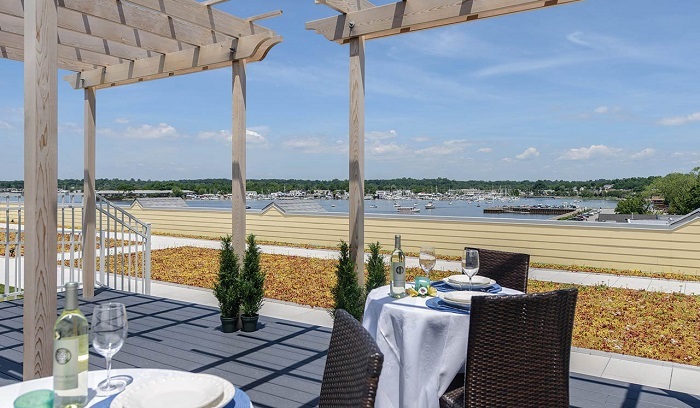 Enjoy a comfortable hotel stay right on the waterfront of Manhasset Bay. The boatel is part of the waterfront condo community of Knickerbocker Bay Club.